The Japanese electronics and telecommunications company Fujitsu first entered the personal computer market in 1981, but their impact on the 1980s Japanese computer market was fairly small, despite the marginal success of their 8-bit home computer FM-7. 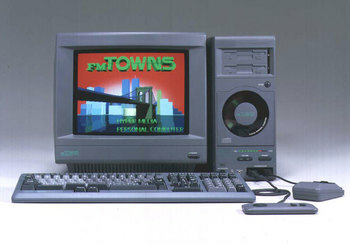 In 1989, Fujitsu introduced the FM Towns, a state-of-the-art 32-bit computer, which took its name from Nobel Prize winner Charles Hard Townes.note ("Townes" was the unit's code name while under development) The FM Towns was one of the most powerful PC platforms released up until then, rivaled only by the Sharp X68000 (which had better graphics, but weaker audio and multimedia capabilities). Advertised as a "hypermedia personal computer," the Towns retained compatibility with Fujitsu's FMR series of MS-DOS business computers, but offered many more features, including a 32-bit Intel CPU, 32,768 simultaneous colors (like the Sharp X68000, but unlike the more popular PC-98) out of a 16.78 million color palette, and a built-in CD-ROM drive. Indeed, the system's graphical operating system, TownsOS, booted straight from a CD. The FM Towns, being more expensive than the PC-98, was marketed to high-income households and educational institutions, and thus its market niche in early-1990s Japan became somewhat similar to that occupied by the Apple Macintosh in Western countries. Video games were available on the FM Towns from the start, though few exclusive titles emerged on the system. The system's game library thrived on high-quality Arcade Perfect Ports, some of which never appeared on other home systems, and enhanced versions of PC-98 and Western computer games. 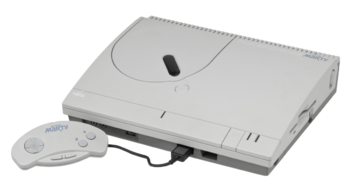 In 1993, Fujitsu launched the FM Towns Marty, a console version that sold for half the price of the computer. The Marty was compatible with most but not all FM Towns games, including those released on floppy disks. Like many other companies' attempts at creating console versions of popular computers, the Marty never really caught on. The FM Towns was ultimately discontinued in 1997. Central Processing Unit: 80386SX at 16MHz in the original Towns and all versions of the Marty. Many later models of the Towns upgraded this to a faster CPU in the x86 line (80486, Pentium). Minimum of 1 MB RAM. 1 MB video RAM, including 128 KB for sprites. Video modes: 320×200 to 1024×768 resolution, with 16 to 32,768 simultaneous colors out of a palette of up to 16.7 million. Video modes could be combined. Sprites: 16×16 size, 1024 maximum on screen. Ricoh RF5C68, eight PCM voices. Yamaha YM2612, six FM channels. Redbook audio playable from CD.